2011 Bolder Boulder 10K – another first! – What is new in Twizzler-land? 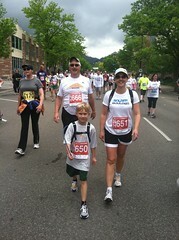 2011 Bolder Boulder 10K – another first! Although it was a cloudy day in Boulder, it was a great day for a morning 10K! After many years of passing it up, Carrie decided to participate in the event for the first time. Carrie has never been a fan of running, but after participating in two 5K’s in the past year, she decided she was up for it this year. So our “walking crew” was 4 members strong this year, with Tobey participating in his 2nd BB 10K and Gramps/Pops again striding with us. My Mom was the lone runner this year representing the Switzer family, and she did great. We were even able to run into her unexpectedly after the race and get some great family photos together. Last year, Gramps, Tobey and I crossed the finishline at 1:48:18 on a sunny day. This year our goal, with Tobey a year older, was to better our time. We did just that – finishing in 1:43:21. So don’t let the clouds in the photos fool you – we all had a wonderful event! May 27, 2010 32nd Bolder Boulder will be memorable!